Tokyo and Beijing once again are trading barbs over the disputed East China Sea island territories – known as the Diaoyu Islands to China, and the Senkaku Islands to Japan. These tiny islands – some literally mere rocks above the waves – have been a source of on-again, off-again tensions between China and Japan for decades, but do not represent the entirety of the complex relationship between the two countries, though looking at international media coverage it would be easy to get the impression of war clouds darkening the relationship. The current round of tension is prompted by Japan’s decision to purchase three of the islands from a private owner, combined with increasing nationalist sentiment driving popular unrest on both sides, and a complex and uncertain leadership transition in China, combined with a weakened Japanese government. Add in to the mix the potential for benefit from fisheries, and the possibility of oil and natural gas resources within the islands’ respective economic exclusion zones (EEZs), and China’s focus on protecting its maritime approaches and its critical sea-lanes of communication (SLOCs), and the actual dispute can gain a momentum which could potentially lead both sides into an unwanted conflict. But although the dispute is potentially dangerous, currently things are not quite as dangerous as media hype would suggest. In the East Asia Forum, Senior Research Associate, Sourabh Gupta examines how both sides are seeking to carefully manage the dispute to prevent a runaway escalation. 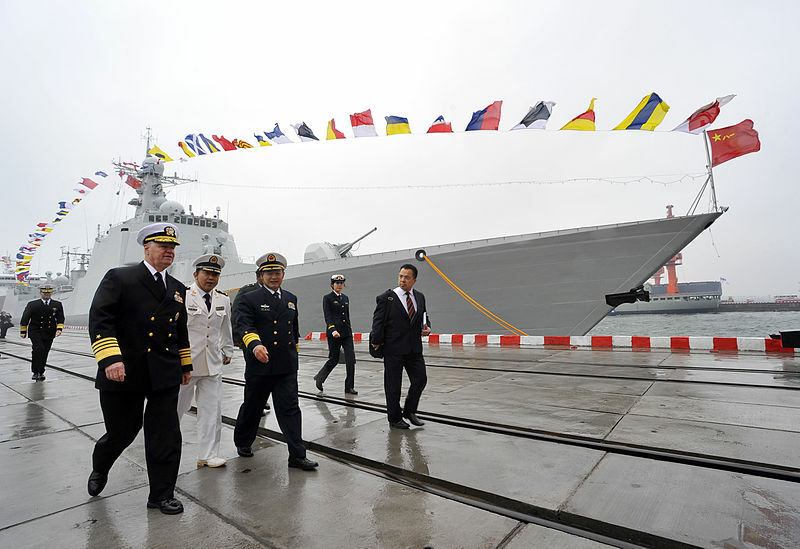 (Sourabh Gupta, ‘Japan and China’s latest spat over the Senkakus, in East Asia Forum, at http://www.eastasiaforum.org/2012/09/23/japan-and-chinas-latest-spat-over-the-senkakus/ ) Gupta notes that unlike the previous round of tensions in 2010 when a Chinese trawler captain intentionally rammed two Japanese Coast Guard vessels within the territorial waters of the Senkakus, resulting in the captain of the vessel being initially held for prosecution by Japanese authorities before being returned to China, this latest crisis emerging from the landing of Chinese activists on the Islands in August, has resulted in the activists being promptly sent back to China. Likewise, although the Noda government has purchased three of the eight islands from a private owner, Japanese Foreign Minister Gemba has ensured that Japan does not seek to reinforce this ownership through building new structures on the islands, or most escalatory of all, stationing Japanese Self Defence Force (SDF) units on the islands. Gupta suggests that the seeds of a future crisis could potentially emerge if the Japanese opposition LDP comes to power and constructs facilities on the island, but argues for the moment that both governments are trying to manage the crisis as best they can, in spite of large-scale anti-Japanese protests in Beijing in recent days. The risks therefore are that future rounds of the crisis could once again promote nationalist upheaval on both sides, generating escalatory dynamics that could fuel the risk of unwanted conflict. This is particularly driven at the grass roots with social media providing the outlet for nationalist forces on both sides to increase political pressure to protect perceived national interests and pride. In recent statements at the Global Dialogue in Singapore, the PLA’s General Zhu Chenghu, a highly influential thinker in China’s national security community and a professor with China’s National Defence University has stated that “as a soldier and a professor I am much concerned about nationalism.” (Greg Sheridan, “General worried by nationalism” in The Australian, September 24, 2012). At the same conference, Professor Zheng Nongnian, the head of the East Asia Institute of the National University of Singapore suggested that rising nationalism in China can be attributed to “a combination of powerful social forces and government actions”, which is leading to complex forces from a broad variety of groups that is promoting a more assertive and aggressive Chinese foreign policy. Most significantly, is the support from the military for nationalist sentiment at the grass roots, but the nationalism is managed from government and used, alongside continuing economic growth, to promote support for the Chinese Community Party. The key issue relevant to the East China Sea dispute, and more broadly to China’s foreign and defence policy posture in the 21st Century is to what extent the Chinese government can continue to manage and control nationalist sentiment, particularly during crises such as that currently occurring with Japan over the Daioyu / Senkakus, or over the South China Sea. Grass-roots nationalism, particularly if extending into government and military ranks, and promoted via social media could be a dangerous force for a rapidly rising power that is building a powerful and modern military capability. A more nationalistic China is likely to promote similar responses in neighbouring states involved with disputes with China, suggesting a more uncertain security outlook because existing disputes become sharper, and more intense, more rapidly. States are likely to seek closer ties to the US to counter-balance China, and the US, whilst not seeking to contain China, will seek to hedge against a more assertive stance from Beijing, particularly if the view from Washington is that China’s government, and the PLA, are exploiting nationalism to further China’s national interest. US security relations with key partners in the region are already drawing it into the risk of unwanted conflicts. The Obama Administration has made it clear that although it remains neutral over the dispute between China and Japan over the Diaoyu / Senkaku Islands, it has reaffirmed its defence commitment to Japan under the US-Japan Mutual Security Treaty. Thus a conflict between Japan and China over the islands could under the treaty draw in the US, particularly if Washington felt that freedom of navigation of the seas was threatened. For many years, the traditional focus of US military planners on Taiwan has driven US thinking on potential conflicts with China. But in recent years, both the intensifying dispute in the South China Sea, and the Diaoyu / Senkaku islands dispute in the East China Sea between Japan and China are now becoming significantly more important, particularly given the current stabilisation of China-Taiwan relations. Thus it is important for the US and China, and ultimately, for China and its neighbours to seek greater engagement, particularly at the military to military level, to manage the increasing challenges posed by these disputes. In a recent statement, US Secretary of Defense, Leon Panetta during a visit to China stated that he sought to identify areas of closer cooperation between Washington and Beijing, but acknowledged that challenges remain. He stated “Part of the question is what we want out of the ‘mil-mil’ relationship. If it is simply to have a channel available, then it is succeeding. If however, it is to have a channel of communications that can avert a crisis, or tamp down escalation at critical moments, that is unlikely to happen under any circumstances” (Reuters, ‘Panetta seeks closer Sino-US ties as China military expands’, 16 September, 2012). With the growth of nationalist-driven disputes, such an observation should be a cause for concern. By Dr. Malcolm R Davis, Assistant Professor and Post-Doctoral Research Fellow in China Western Relations, Department of International Relations and Centre for East-West Cultural and Economic Studies, Faculty of Humanities, Bond University, Gold Coast, Australia.